The 1965 war between India and Pakistan was the second conflict between the two countries over the status of the state of Jammu and Kashmir. The clash did not resolve this dispute, but it did engage the United States and the Soviet Union in ways that would have important implications for subsequent superpower involvement in the region. The dispute over this region originated in the process of decolonization in South Asia. When the British colony of India gained its independence in 1947, it was partitioned into two separate entities: the secular nation of India and the predominantly Muslim nation of Pakistan. Pakistan was composed of two noncontiguous regions, East Pakistan and West Pakistan, separated by Indian territory. The state of Jammu and Kashmir, which had a predominantly Muslim population but a Hindu leader, shared borders with both India and West Pakistan. The argument over which nation would incorporate the state led to the first India-Pakistan War in 1947–48 and ended with UN mediation. Jammu and Kashmir, also known as “Indian Kashmir” or just “Kashmir,” joined the Republic of India, but the Pakistani Government continued to believe that the majority Muslim state rightfully belonged to Pakistan. 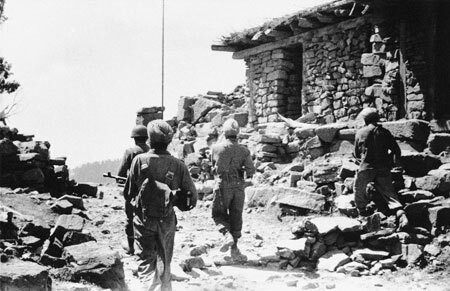 Conflict resumed again in early 1965, when Pakistani and Indian forces clashed over disputed territory along the border between the two nations. Hostilities intensified that August when the Pakistani Army attempted to take Kashmir by force. The attempt to seize the state was unsuccessful, and the second India-Pakistan War reached a stalemate. This time, the international politics of the Cold War affected the nature of the conflict. The United States had a history of ambivalent relations with India. During the 1950s, U.S. officials regarded Indian leadership with some caution due to India’s involvement in the nonaligned movement, particularly its prominent role at the Bandung Conference of 1955. The United States hoped to maintain a regional balance of power, which meant not allowing India to influence the political development of other states. However, a 1962 border conflict between India and China ended with a decisive Chinese victory, which motivated the United States and the United Kingdom to provide military supplies to the Indian Army. After the clash with China, India also turned to the Soviet Union for assistance, which placed some strains on U.S.-Indian relations. However, the United States also provided India with considerable development assistance throughout the 1960s and 1970s. U.S.-Pakistani relations had been more consistently positive. The U.S. Government looked to Pakistan as an example of a moderate Muslim state and appreciated Pakistani assistance in holding the line against communist expansion by joining the Southeast Asia Treaty Organization (SEATO) in 1954 and the Baghdad Pact (later renamed the Central Treaty Organization, or CENTO) in 1955. Pakistan’s interest in these pacts stemmed from its desire to develop its military and defensive capabilities, which were substantially weaker than those of India. Both the United States and the United Kingdom supplied arms to Pakistan in these years. After Pakistani troops invaded Kashmir, India moved quickly to internationalize the regional dispute. It asked the United Nations to reprise its role in the First India-Pakistan War and end the current conflict. The Security Council passed Resolution 211 on September 20 calling for an end to the fighting and negotiations on the settlement of the Kashmir problem, and the United States and the United Kingdom supported the UN decision by cutting off arms supplies to both belligerents. This ban affected both belligerents, but Pakistan felt the effects more keenly since it had a much weaker military in comparison to India. The UN resolution and the halting of arms sales had an immediate impact. India accepted the ceasefire on September 21 and Pakistan on September 22. The ceasefire alone did not resolve the status of Kashmir, and both sides accepted the Soviet Union as a third-party mediator. Negotiations in Tashkent concluded in January 1966, with both sides giving up territorial claims, withdrawing their armies from the disputed territory. Nevertheless, although the Tashkent agreement achieved its short-term aims, conflict in South Asia would reignite a few years later.